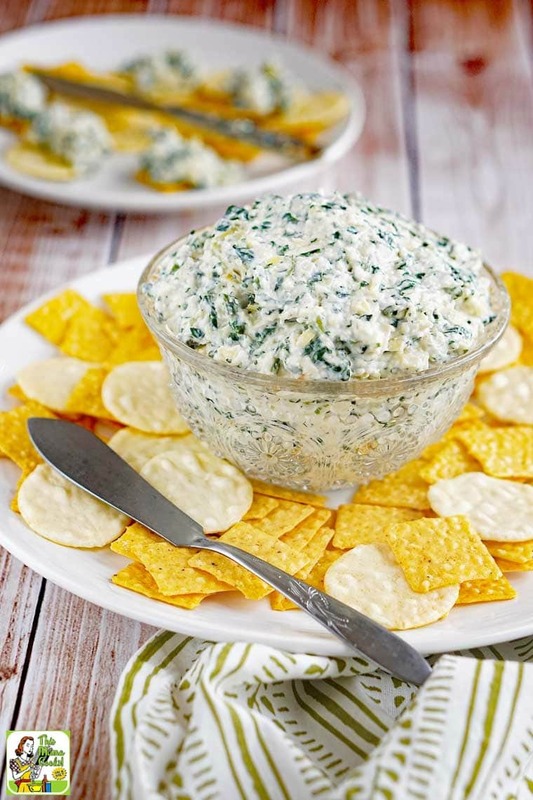 Want to serve a Spinach Artichoke Dip at your next party? But don’t have time to fuss with something too elaborate? Then you’ll love this spinach artichoke dip recipe! This easy spinach artichoke dip is served cold, so no need to spend time heating it up – and keeping it warm for your guests. This recipe uses convenient ingredients like canned artichokes and frozen, already chopped spinach. Buying grated Parmesan cheese from the store helps save time, too. Best of all this spinach and artichoke dip recipe tastes great and will be a hit with your guests! Traditionally, Spinach Artichoke Dip is made with sour cream. I decided to try something different by using Plain Silk Almondmilk Yogurt Alternative to make my dip more wholesome. Silk Almondmilk Yogurt Alternative comes in five flavors: Peach, Strawberry, Vanilla, Dark Chocolate Coconut, and Plain. It’s available in single cups and 24 ounce tubs and made from California almonds. It’s vegan, carrageenan-free, gluten-free, cholesterol-free and soy-free. Use Silk’s store locator to find Silk Almond Dairy Free Yogurt Alternative in your area. (I found it at Walmart in my area.) And before you go, visit the Silk website for a coupon! 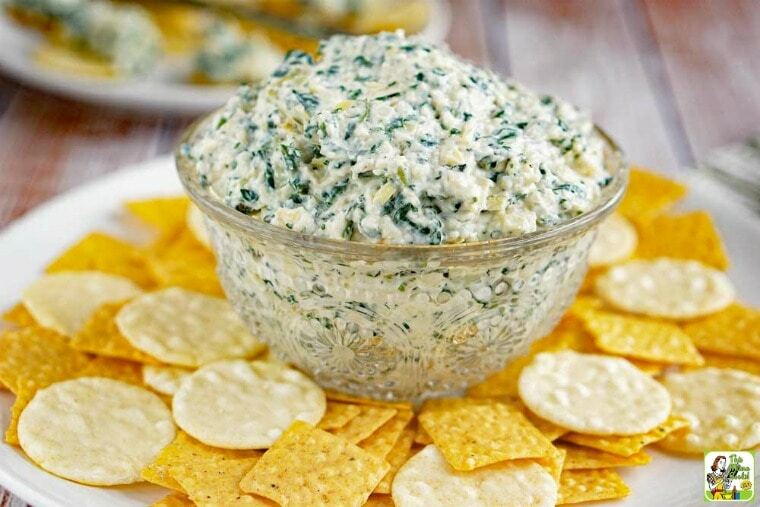 How to make spinach artichoke dip even better! You’ll notice that I’ve made the Parmesan optional in this spinach artichoke dip recipe. You can add half the amount or leave it out completely. This spinach and artichoke dip takes great without the cheese. Everyone has their favorite brand of mayonnaise. (I like an olive oil mayo.) But if you’re watching the calories, choose a lite version. You could also cut it back to 1/2 cup without affecting the flavor. Make sure you use the artichokes canned in water and not the type packaged in oil. No need for all those extra calories! 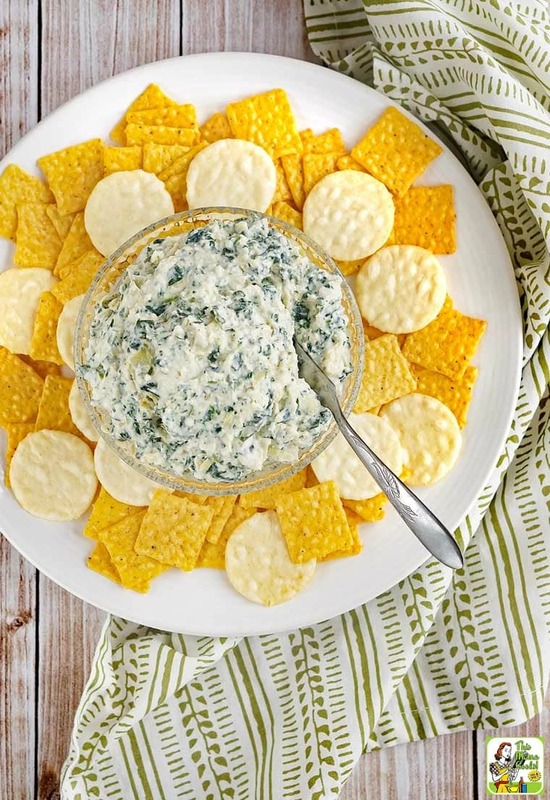 Finally, serve the Spinach Artichoke Dip with either baked rice crackers or veggie sticks. Make sure to squeeze out all the liquid from the thawed out spinach. (You’ll be surprised how much water there is!) The easiest way I found to do it was to dump the thawed spinach into a bowl. Then I placed a few paper towels on top of the spinach. I took the bowl to the sink, tipped it, and pressed down on the spinach. I did this a few times until all the water was pressed out. Use a food chopper to chop up the artichokes and water chestnuts. It’ll save you so much time! You could also try making this spinach and artichoke dip in a high speed blender or food processor. Experiment! 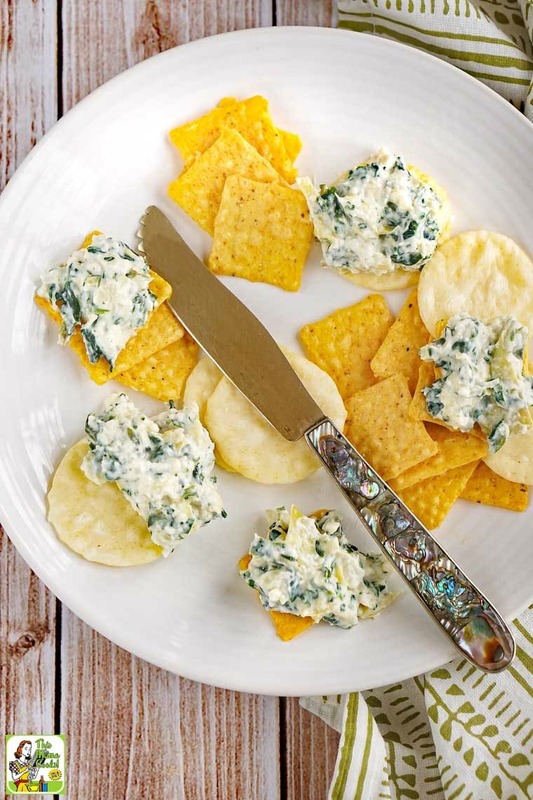 You can add a little dill (fresh or dried), Greek seasoning, or some hot sauce to this spinach artichoke dip recipe for fun. Looking for more party dips? Try Avocado Dip Veggie Shooters. Place the spinach in a medium bowl. Squeeze water out of thawed spinach. Serve in a bowl with crackers.